What is European Registration of Toxicologists? Figure showing ERT Requirements taken from Fowler and Galli, Toxicology Letters 2007, EUROTOX’s view regarding the ROLE and TRAINING of certified European registered toxicologists (ERT). The European Register of Toxicologists is a service of EUROTOX established in 1994. It constitutes a list of toxicologists who excel by high standards of education, skills, experience, and professional standing. The intention is to foster competence in practice and science and to provide to the public an authoritative source of information on toxicological competencies. Individuals who want to be registered and are found to comply with the requirements defined by EUROTOX and National Societies of Toxicology, and are accepted, are qualified to use the title EUROPEAN REGISTERED TOXICOLOGIST, ERT, with their name. Registration is performed by a two-step procedure. First, National Registration boards in Europe evaluate applications of candidates according to a consensual process described in the ERT Guidelines for Registration (shown below) and admit successful applicants to the national register. Second, upon request, EUROTOX will certificate these individuals as ERT. ERT are listed by EUROTOX according to their country and date of registration or re-registration. Currently, EUROTOX lists almost 1500 toxicologists as ERT. 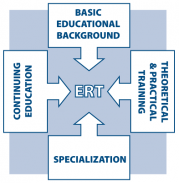 Qualified toxicologists recognized as ERT are now working in a wide array of different fields (drug, nutritional, chemical and environmental safety, risk assessment and risk management, basic research, clinical and occupational toxicology, etc). To cope with the diverse needs in these different fields the Guidelines for Registration envisage training in the basic topics of toxicology, and in addition offer numerous options for specialisation. Course organisers interested to submit their courses for recognition can use the following application (when you click on the link, the document will download directly to your download folder).